Tuttle: For this particular review, me and my co-writer, Rebecca Agler, decided to tag team the duties of writing about ‘Brave’. It seems like a movie that most of the general public went to see, and it was also a film that both Agler and I were particularly disappointed with. I know what you are thinking. “I thought ‘Brave’ was a pretty good movie.” Well, it very well might have been, but a ‘pretty good’ Pixar movie, in my mind, is a HUGE step backwards for a great production company. This is the same studio that gave us ‘Toy Story’, ‘Finding Nemo’, ‘WALL-E’, and my personal favorite ‘Up’. I mean think about it, can you think of many movies that tell a story better than ‘Up’? That montage that made all of America weep and weep again? Pure movie magic. Agler, why do you think we are so attached to these older Pixar movies? Agler: It’s because they’re stories that are so easy for us to relate to. Just think of ‘Toy Story’. Now, where do I begin with why I love ‘Toy Story’? A common part of childhood we all had when we were little tykes, whether it was playing with a dolled-up Barbie or macho (insert male toy), was making our toys talk and have human tendencies. The idea that our toys were more than toys was what every kid dreamed of. That’s why we can all relate to growing up but refusing to give our toys away despite our mother’s nagging wishes. We formed an unbreakable allegiance to our plastic friends. These friends didn’t tire of hours upon hours of play time, didn’t care how lame our imaginative scenarios were, were often chosen instead of other activities, and were our companions when the real people around us were not. This storyline is there in all three ‘Toy Story’ movies; they’re not so much about toys as much as they’re about growing up. You could say the same thing about ‘Monsters Inc.’ and ‘The Incredibles’. These movies, although some might call them ‘kids’ movies’, are about very real things. Tuttle: And this brings us to ‘Brave’. Obviously, I went in with high expectations, given how great the Pixar movies of the past have been (sure ‘Cars 2’ was awful, but no one really liked ‘Cars’ that much in the first place). I think the biggest reason that I was let down with ‘Brave’ was the fact that the story was not unique in any way. In reality, you could take the characters of ‘Brave’, and the storyline of ‘Mulan’, and end up getting the same exact movie. Woman must marry man, but woman wants independence. Woman makes statement about independence and must endure conflict. Women overcomes conflict when society makes compromises. Cue credits. It’s all seems very formulaic and unoriginal to me, a story that we’ve all heard a million times. Agler: I wasn’t quite sure what to expect with Brave, but it didn’t hit me until the end that this movie was not what I expected it to be, so it fell below my expectations. I have to say it kept my attention, and I wasn’t always sure what would happen next. But I was left thinking “what a letdown” because there were really no endearing characters. Yes, the connection between mother and daughter brought tears to my eyes while watching with my own mother, and yes, the change of a girl choosing singlehood over marriage is rare and possibly a first for childhood memories (hooray!) , but other than that, there was really nothing all that great as far as the characters go. The animation was of a higher quality and inspiring, but the story, the story was lacking. I honestly don’t know if they could’ve made it any better. It seems to be a stinker from the beginning. Tuttle: I think the script could really be to blame. I mean, other Pixar movies had the creative genius of Brad Bird, Pete Docter, among others. Mark Andrews and Brenda Chapman headed this one up, and in my mind, just really fell short. I know of a lot of people that were really excited to see, for the first time, a female lead character in a Pixar movie. Especially in a year that gave us strong women like Katniss Everdeen, Suzy Bishop, Selina Kyle, and Black Widow, how do you think Merida measured up to the rest? Agler: Merida was stubbornly independent, willful, and determined. But her actions and decisions didn’t scream “remember me, I’m different.” She missed the boat on that certain character trait, that spark, found in classic female characters in animated movies. Let’s take her and compare her to Belle from ‘Beauty and the Beast’. Belle was stubbornly independent when ignoring her town and loving her father anyway, was willful when refusing to settle and marry a jerk, and determined to see the good in the Beast. But we got to know Belle while witnessing her deep compassion for those around her, her numerous encounters with the Beast, her simplicity when it came to life and how she didn’t need her every move catered to, and her fierce determination to seek justice and equality. Merida had potential to be a strong female character, she was in scenarios where she could have stood out, but it’s almost like she didn’t cross over the finish line. He started to be great but stopped half way. 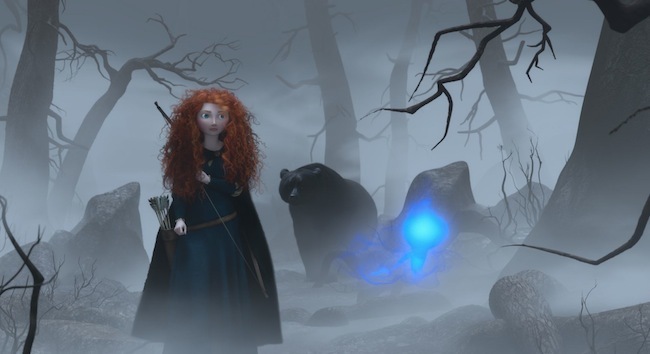 For example, Merida was the reason her mother turned into a bear. She would’ve stood out as a true heroine if she would’ve, let’s say, traded her humanity with her mother so her mother could become human again. 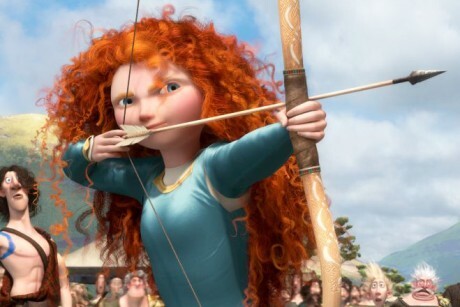 Instead, the way her mother transformed was really no burden on Merida: all she had to do was sew a canvas together. There were simply no heroic acts that made Merida worthy to be called a classic heroine. Tuttle: Agler, I think with what you just said, you revealed a key point to how ‘Brave’ really missed the boat, and it’s the fact that out main character didn’t have to sacrifice anything but a kooky evening of shenanigans in order to solve the conflict. In reality, it was the mother that was forced to be the hero, to suffer trials and achieve resolution. As an audience member, I felt no connection to Merida, and therefore didn’t feel any connection with this movie. Also, that old witch? Worthless character, through and through. Absolutely no purpose. She didn’t even show up after the spell was broken to offer an answers. I would’ve rather had Billy Crystal as Miracle Max than that irrelevant hag. So where does Pixar go from here? I mean, with ‘Cars 2’ and now ‘Brave’, they’ve made two pretty mediocre movies in a row. Should they keep going for sequels, or do they try to write another unique story? They’ve now struck out in both categories. Agler: I’d definitely say new, original stories. With Pixar, it’s almost too risky to have a sequel. Toy Story was lucky, but the rest should be left alone due to their finality in ending and overall creativity. Some stones are better left unturned. It seems like there is a repeat in movies these days: new characters and settings, same ideas. Fresh, new ideas are hard to come by, so Pixar landing one will be a great success and something worth working towards. Brave was a new idea, but the execution was horrible. Tuttle: If they just keep re-releasing they’re good movies in 3D, they should do just fine. *cue ominous music here*. Agler: I think its understandable that our expectations are high after the stellar movies Pixar has made. But the last two are causing me at least to be cautious in my excitement. Pixar is simply struggling like all other production companies with the need for originality, but I would say they of all companies should be able to come up with something due to their unique perspective in movies. Our Note: ‘Brave’ falls short, but remains to be at least a decent movie for the whole family. Pixar: We want better than decent. Can this really be the best and most exotic? What if we lived in a world where every man had a British accent? How absolutely wonderful would that be…..if only it were true. I mean come on. The female population would be more inclined to settle down with a dreamy man who could woo them with that bloody brilliant speech. Besides being incredibly attractive speakers, the World of Brits seems more at large as of late. Maybe it’s due to the Olympics taking place in London. Not only are they hits with their cunning speech and location, but they’ve also found a place in the spotlight on television screens. It seems like the Brits are coming out on top in captivating series. Specifically on the BBC channel we encounter hit shows like Sherlock (4 nominations beating out AMC’s The Walking Dead) and Downton Abbey (16 Emmy nominations). Since I have yet to watch Sherlock, I can only speak for Downton Abbey. It is a remarkable series built with a solid cast which, in my opinion, is the reason for its popularity. I ask again, what’s not to love about these British characters? With this in mind, a movie has come along that contains some of the brilliant actors found in these series. It probably won’t stand the test of time like most, but it deserves praise none the less. If you classify yourself as having a passing fancy for some enchanting British television, I encourage you to read on. 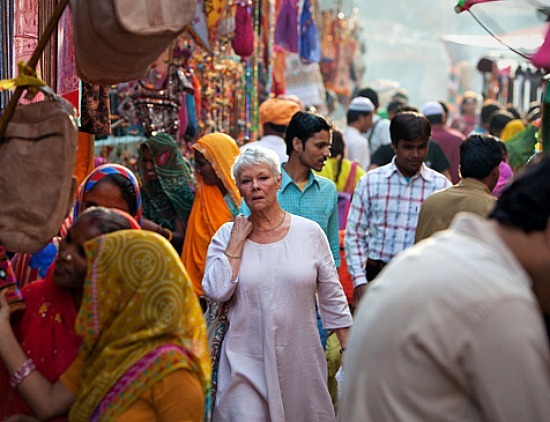 The movie is The Best Exotic Marigold Hotel, and the location is India. The plot concerns the lives of seven elderly chaps and dames coming together to a place that is supposedly built for them from the ploy to “Come and spend your olden years in an Indian palace.” To some folks from different walks of life whilst in the same age group, this slogan seems overly enticing. The elderly are viewed as a bunch of old farts about to croak. Retirement is the life, children see them as a burden, their agility has significantly lessened, and luxury is a dream that doesn’t fit into their present conditions. They don’t see a purpose in life anymore. Or perhaps they’ve lost something or someone so significant in life that moving forward or starting over seems utterly impossible. What if they can find a new purpose, a new perspective? What if they can change and affect others in ways they never dreamed possible, especially at this point in their lives. The possibility of fulfilling dreams by a refusal to accept the norm for people their age is what drives them to uproot and move to place foreign and completely opposite of what they’ve always known. What do they have to lose? Not much, according to society’s standards. Hence, all of them end up at said hotel. The “what if” is more than tantalizing in place of a dull existence. “It’s a luxury development where all the residents are in their golden years” says one of our adventurous friends. And an adventure it certainly becomes. Things are definitely not what they seem upon arrival. The culture is nothing less than an absolute shock, and the state of the luxurious motel is the complete opposite of “luxury.” Luckily, at the end of it all, they discover that “The light, colors, smiles, it teaches [them] something.” Let’s take a look at our lead characters and the qualities that make them unforgettable. Our next fellow is the leading man, Graham Dashwood, played by brilliant actor Tom Wilkinson (Carmine Falcone in the new Batman trio, also seen as Arthur Edens in Michael Clayton). This is a man whose success has been grounded in the high courts as a prestigious judge. He is finally done after a split second decision, and the move to India is all he cares about. We come to learn that this is not his first time to see the sights of India, for he lived there for a time as a boy. Every day he sets out to find someone whom he loved as a youth, but parted with disgrace and in prejudiced times. This man is the only love Graham has ever known, and to simply know he is alive and well is what drives him each and every day. Discovering that the guilt he carried his entire life was of his own creation frees him to accept redemption and complete happiness. To laugh and learn about the man before him with a family of his own connects Graham to the life he wished he would have been allowed to have, and the perspective makes his glass no longer half empty, but finally half full. The couple in this film is Douglas (Bill Nighy also known as Davy Jones in the Pirates movies) and Jean Ainslie (Penelope Wilton as seen as Isobel Crawley from Downton). Doug and Jean seek a new life after losing most of the money they’d acquired for retirement after investing in their daughter’s frugal business. Jean is evidently repulsed by the opposite of what they expected, so she refuses to conform or accept the fact that she can start afresh. Doug has suffered years of abundant negativity and lack of respect from Jean, and he luckily discovers contentment and peace alongside a newly discovered connection with Evelyn. We find out whether or not this couple can put aside built up grudges and start a new chapter in their lives in this foreign place. Feisty Muriel played by the wondrous Maggie Smith (Violet Crawley in Downton and Professor McGonagall from Harry Potter) finds herself in need of a hip replacement in a place where she’s promised a quick and inexpensive procedure. She holds her own with racist tendencies after a life of devotion to an adopted family who replace her with someone younger. Along the way, she fights to apply the idea that “If I can’t pronounce it, I don’t want to eat [or have anything to do with] it.” Muriel unknowingly bestows acceptance on a young girl accustomed to having no status or recognition in life. She finds new ways to implement her acquired skills including a head for figures in a new life which she thought was unattainable with her background. Ironically, it is Maggie who changes the course of the hotel. Our final duo are the well endowed Madge (Celia Imrie) who is hunting for her next husband alongside Norman (Ronald Pickup), a man who is trying to remain youthful and vigorous by pursuing reckless short term encounters with younger women as a matured Lothario. Both go to great lengths of fitting in with the high society by pretending to be a sort of royalty from England. The acceptance of how old they really are is difficult to accept while desiring to feel needed and loved by someone truly worthy. Their efforts are highly entertaining and happily resolved. The glue that holds all these characters together is the fisher who lured them in, Sonny Kapoor played by the up and coming Dev Patel (Jamal in Slumdog Millionaire and Prince Zuko in The Last Airbender). Sonny is the dreamer and part owner of the hotel, and his optimism despite the somewhat false advertising is evident in the idea that “In India we have a saying. Everything will be alright in the end. So if it’s not alright, it is not yet the end.” He deals with an overbearing mother trying to douse his dreams by orchestrating an arranged marriage, and keeping the woman he loves (Sunaina played by Tena Desae) despite his mother’s evident objection. Sonny sees things as they can be, and he refuses to conform to the standards of his family. He too receives perspective from the occupants who inspire him to fight for all he envisions. 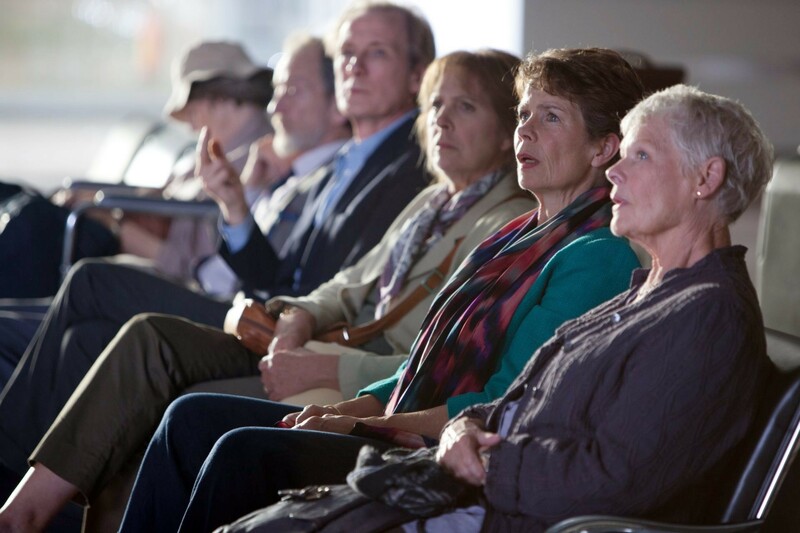 My Note: The Best Exotic Marigold Hotel is brimming with revolutionary cures, vices, and opportunities for the overlooked elderly. Liam Neeson speaks these lines at the opening of Christopher Nolan’s ‘Batman Begins.’ When Nolan reopened the book on the classic character, ‘Batman Begins’ first tells us the story of Bruce Wayne. Born into a life of privilege, Bruce was given loving parents that gave him an example of goodness; but, while still a young boy, his family was gunned-down in the street. Driven by anger and a desire for justice, Bruce flees his city of Gotham in search for an answer. Years later, he finds himself in a Chinese prison, still ferociously fighting his fellow captives. It is here that Bruce is offered a path; to become a incorruptible symbol of true justice. He returns to Gotham where he chooses to pursue a life of battling criminals, not as Bruce Wayne, but as the masked-hero Batman. In ‘The Dark Knight’, Batman must face his greatest challenge yet; the rampaging, senseless killer that calls himself The Joker. Motivated only by his desire to “watch the world burn,” The Joker throws Gotham into a state of chaos. But Batman is not alone. His is aided by Police Commissioner Jim Gordon and District Attorney Harvey Dent. Together, the triumvirate battles against the violence of a maniac, we watch as an “unstoppable force meets an immovable object,” and although our heroes succeed in capturing the villain, it was not achieved without considerable loss. Harvey Dent, Gotham’s white knight, was driven into madness and dies after going on a murderous rampage. Refusing to let evil win, the Batman takes the fall for Dent’s crimes. They raise Harvey Dent as a hero in order to invoke change in their city, casting out Batman as an outlaw; Bruce Wayne and Jim Gordon must keep the secrets of what really happened that night. Christopher Nolan closes his story of Batman in ‘The Dark Knight Rises’ with a finale that is both modern epic and complex drama, giving us a third act that does not disappoint those that have fallen in love with Nolan’s Gotham. Not only does this film meet the impossibly high standards that were set before it, but it found even more ways to wow us with spectacular filmmaking. ‘The Dark Knight Rises’ takes place 8 years after the events of Harvey Dent’s death. Our hero, Bruce Wayne (played again by Christian Bale), has become a recluse, claiming that he has hung up the cowl and cape for the last time. Gotham is at peace because of Commissioner Gordon’s newly empowered police force, but this calm remains based on a lie. The weak foundations that our heroes built are waiting to be shaken up. The storm hits Gotham in the form of a new evil; a masked mercenary named Bane (played by Tom Hardy). Intimidating in size, and frightening in mission, Bane claims that he is “Gotham’s reckoning” and a symbol of the “borrowed time” that the city has been living on. Bane has one mission; “We will destroy Gotham.” When told of the evil that is rising in the city, Bruce Wayne must do what is required of him; The Batman must come back. What follows is an amazing, action packed, and purposeful movie. Once this thing gets going, and it does take some time to get going, it cannot be stopped. We are swept up in the story of our hero as we wait for the fate of Gotham City. It’s really a movie that I didn’t want to end. Fantastic in scale and satisfying in finality. 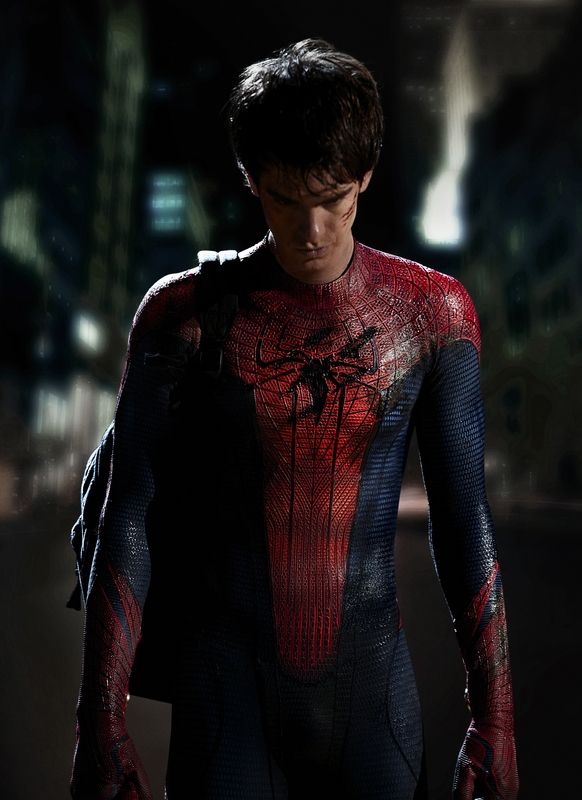 With this new superhero installment, we are also presented with an array of new and influential characters. Anne Hathaway gives her performance as Selina Kyle, also known as Catwoman, with intensity and sharp attitude, giving us a woman who often crosses the line between right and wrong. Joseph Gordon-Levitt (one of my personal favorite actors) plays John Blake, a virtuous young police officer who shares the Batman’s devotion to justice, and who becomes a character of great importance to the story of Gotham City. And then there’s Miranda Tate (played by Marion Cotillard), a beautiful ally that Bruce can find friendship in, so much so that Bruce eventually trusts her with the running of Wayne Enterprises. The introduction and establishment of these new faces might begin as a burdensome task, but in the end I was so glad that the Nolan brothers took as much time as he did to place these characters into the foreground of the story. Each one of them has great amount of purpose in ‘Rises’, and are vital to the conclusion of the film. Writing a review for ‘The Dark Knight Rises’ is honestly a difficult task, because I see it as being a film of great depth that has so much lying underneath the ice, and like the character of Batman itself, it is much more than a man in a mask. But this is simply the marking trait of Christopher Nolan’s films; it inspires discussion, thought, and challenges the way that we see things. I can’t think of any other director working today that can accomplish the mass appeal of a blockbuster-smash as well as the intelligence to tell a deep story; the ability to please movie goers of all kinds. Not only does Nolan accomplish this with ‘The Dark Knight Rises’, it has now become the norm for all of his films, making him a man among boys. He hasn’t made a bad movie. Ever. Just think about that. Who else can say that? I could write an essay just simply on the themes that are presented to the audience in this film, incredibly daunting themes such as resistance, perseverance, righteousness in the face of evil, and the sacrifice that it takes to do make what is right. We see that sometimes fear is necessary to do the impossible. ‘Rises’ also presents us with heroes that have made mistakes, that are not perfect, but are willing to do what it takes in order to set things right. Most of the film is dark, but at the end of it all, its this darkness that makes the light at the end of the tunnel so much brighter. All of this, in a movie about a guy in a bat costume. Who’d of thunk it? In my mind, the best thing about ‘Rises’ is the ending, which I will not describe in detail here (trying to be respectful of those who are avoiding spoilers). What I will say is that the conclusion of Nolan’s last Batman movie makes it not just about the struggle against a madman, but the establishment of a legend. The film is on a mission to fulfill the promises of the first two movies and make Batman transcendent, bigger than just vigilante, and a symbol that was tested through trials. Not only to the people of Gotham, but also to the audience, this character has truly become more than just a myth. And no matter what happens in the end, the Dark Knight will rise as a hero, one way or another. 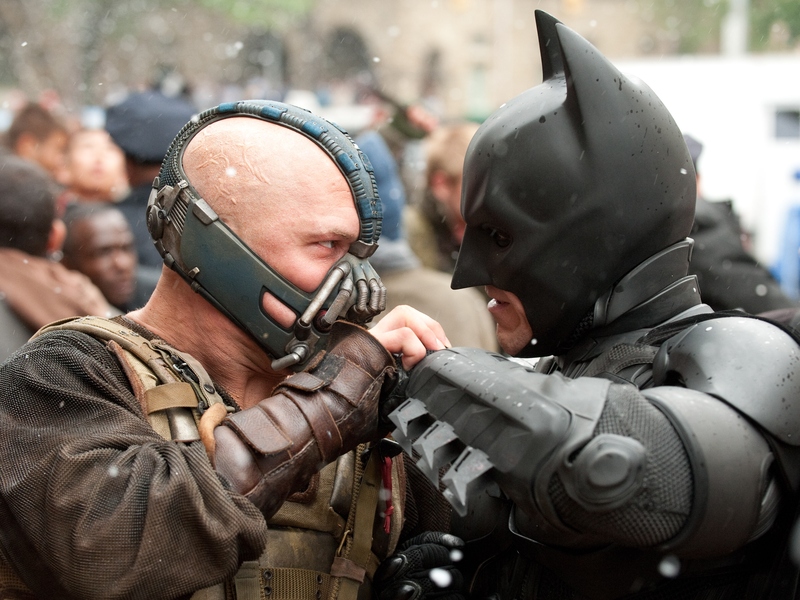 Now for the burning question; is ‘The Dark Knight Rises’ better than the film that preceded it? My answer is no, but I still maintain that it did not have to be better, and I don’t think those involved were trying to make a better movie than ‘The Dark Knight.’ One thing that was obvious to me when I sat in the theater was how different this movie was from the previous two. It wanted to say something new, something meaningful. Nolan’s purpose was to tell the last chapter of Bruce Wayne’s story, to give a powerful conclusion these films. In doing so, he established these three movies as being one of the best film trilogies of all time. 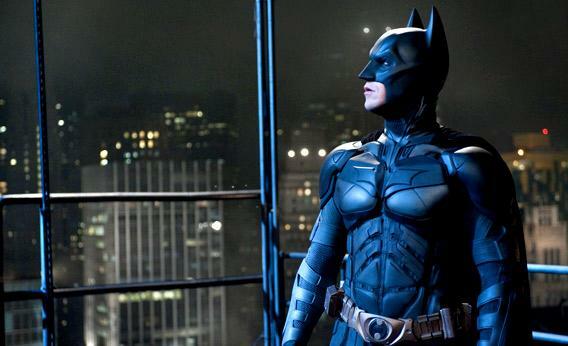 My Note: ‘The Dark Knight Rises’ is a great ending to an unforgettable saga. There are some things in life that are only there to make you laugh. Nothing more than a chuckle to make you feel better for a moment. These things aren’t bad, but they don’t last very long, and eventually lose their charm. When was the last time that you watched or listened to Dane Cook’s stand up comedy? The answer, for most of us, would be the 8th grade, some time before you discovered ‘The Office’ and Demetri Martin. But when you were thirteen, Dane Cook was the funniest man on the planet. I remember listening to those bits with my friends, laughing so hard that we were crying on the floor. We would listen ‘Harmful if Swallowed’ again and again, quoting it so much that our parents considered donating us to an animal shelter. But then Mr. Cook’s next album came out, and it was more of the same. Then he starred in a few terrible movies that someone convinced us to see. Then another album of the same old stuff. Eventually, Dane wasn’t that funny anymore. Seth MacFarlane; you are slowly becoming the new Dane Cook. You are funny, yes, very funny indeed. But until you try something new instead of the same old schtick’s over and over again, you will laugh yourself right out of relevancy. Well, someone, must have told him to stick to what you know, because ‘Ted’ is just more of the same. It’s not a bad thing in the short term, but at the end of the day, it makes for an unfulfilling movie-going experience. In the story of ‘Ted’ is simple, and by simple I mean there’s not much of a story… at all. 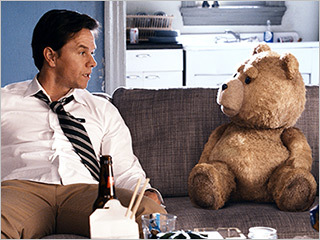 When John Bennett (played by Mark Wahlberg) is a lonely little boy, he makes a wish for his Teddy Bear to come to life. Sure enough, the next day Ted is a walking, talking stuffed animal with a personality all his own. 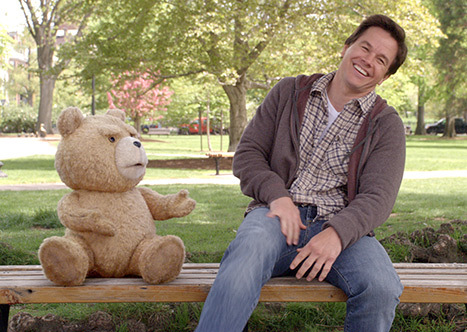 John and Ted soon become best friends and “Thunder Buddies”. But as time goes on, and John begins to grow up, so does Ted, and Ted grows up to be an immature, disgusting, freeloading roommate that is holding John back. John’s girlfriend, Lori (played by Mila Kunis), does a very “Meg Griffin” thing and gives John an ultimatum: Ted needs to move out of the apartment or else John and Lori are through. Ted agrees, and what follows are the just growing pains of John and Ted learning to live apart from each other. That’s the movie. There are no real plot changes, nor is there real character development, but there is a bunch of funny stuff that happens along the way. Ted gets a job at a grocery store, where he meets a cashier that soon becomes his girlfriend. He can’t get fired at the grocery store not matter what he does, leading to some pretty hilarious dialogue between Ted and his boss. John and Ted spend a night partying with their childhood hero, Flash Gordon, in a drunken montage that is nothing but hysterical. Joel McHale creeps on Mila Kunis at work. Joel McHale is funny, right? John sings a song for Lori in front of thousands of people at a Norah Jones concert. Too bad he can’t sing. It’s funny though. Ted is eventually kidnapped by obsessive fans; obsessive and psychotic fans! Giovanni Ribisi plays a great role as a disturbingly bad father. This is probably the funniest part of the movie. There are also a bunch of offensive one-liners that are funny based on shock value alone. There is one joke about Parkinson’s disease that I would say is over the line, and caused uncomfortable laughter in the theater. These are the really funny moments that I can remember right now. Everything above is what I recall about going to ‘Ted’. Doesn’t seem like much, does it? That’s because it isn’t. Listen, I don’t mean to seem rude, and I don’t want to say that I didn’t enjoy it. It’s the funniest movie I’ve seen all year, and it honestly seemed to please the crowd that I saw it with. There were a few parts that I had laughed so much my abs were sore. But then it ended, and I realized that the ending of the movie was very reminiscent of the beginning. Everything was back to the way it was, and no real conflict was really solved. It was just a funny hour and a half. The biggest problem that I have with the story of ‘Ted’ is the main character, John. Not for one moment do I believe that he loves his girlfriend enough to grow up and change, because he never does. He just screws up a lot, apologizes later, and everything is honky-dory. What happens the next day? Do John and Ted do something stupid again and Lori angry? The conflict is still there. It’s like an episode of ‘Family Guy’; you know that every week Peter is going to do something stupid that makes Lois angry, he apologizes, next episode. In real life, I would question whether or not Peter loves Lois at all. He doesn’t show it to me through growth and change. If you think about it, the best loves stories are about sacrifice, compromise, and risk. Something has got to give inside these two people or else it’s just not worth it. ‘Casablanca’- Rick makes Ilsa get on the plane. ‘Up’- Ellie leaves Carl a message to stop mourning and live his own adventure. ‘It’s a Wonderful Life’- George Bailey gives up his dreams to travel and see the world, because he loves Mary more than his ambitions. Those make the best love stories. In comparison, anything else seems trite and inauthentic. It’s a good laugh, but no real heart. A funny quote, but makes no real affect on the way you think. Movies like this are incomplete by design, so I’ll simply wait for the sequel and see if these idiots really learned their lesson. Until then, I’ll watch some ‘Family Guy’ for a few laughs. My Note: This raunchy comedy about your childhood Teddy Bear is really, really funny, but it isn’t anything better than that. The “End of the World” movie has become such an overplayed scenario over the last decade. Maybe it’s the fact that the Mayan calendar predicted that the apocalypse will greet us in just a few short months, or perhaps it’s just the scare of global warming slowly melting the Arctic circle. It could be that LeBron James finally won a NBA Championship, so a global catastrophe really doesn’t seem out of the question. For whatever the reason, between ‘The Day After Tomorrow,’ ‘2012,’ ‘The Core,’ ’28 Days Later,’ ‘Sunshine,’ not to mention ‘Deep Impact’ and ‘Armageddon’ (which are, by the way, the same exact movie), I’ve just grown tired of all the doom and gloom that we’re seeing on the silver-screen these days. Can you blame me? Does anyone remember the Los Angeles Super Tornadoes in ‘The Day After Tomorrow’? What was that all about? Despite my jet lag from watching our planet become ruin time and time again, I decided to take a chance and go see ‘Seeking a Friend for the End of the World.’ I love Steve Carrell. I love Keira Knightley. I love dark comedy, and I was hoping that this movie would be a different perspective on Earth’s swan song. Not all romantic comedies begin by telling you that a giant asteroid is going to destroy the world in just a few short weeks. Then again, ‘Seeking a Friend…’ is unlike any romance that you have ever seen before. Half-sarcastic comedy, half-touching love story, this movie is one-hundred percent original, and thank the Lord for that. The film, like most love stories, centers around our two lead characters. Our hero, played wonderfully by Steve Carrell, is Dodge. Dodge’s wife abandons him in the very first scene of the movie. After hearing the news that the planet is a ticking time-bomb, she simply gets out of the car and runs away. Unlike his closest friends and family, who are determined to ring in the apocalypse with partying and anarchy, Dodge wants something more out of his last living days. He ends up going through old photo albums and letters, reminiscing about his old high school sweetheart; his first love. Dodge decides to forgo the fireworks and self-deprecating festivities in order to find his long lost love and declare his undying devotion to her, and of course, do this before the clock strikes midnight. 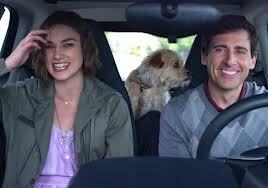 Dodge’s next-door neighbor is a young woman named Penny (played by Knightley). Penny is a quirky, neurotic, pot-smoking head case who became even more unglued once she heard about the giant meteor… asteroid… whatever. She loves old records, hates her failing relationship, and can sleep through anything. Filled with regret about the time she has spent away from her family in the UK, Penny is heart-broken that she couldn’t get home before all of the airports were shut down. One night, a riot breaks out near Dodge and Penny’s apartment building. Dodge rushes to make sure that Penny gets out of the building, and while on the run, they strike an agreement. If Penny will help Dodge find his first love, then Dodge will make sure that Penny can get on a plane to see her family one last time. They set on the road, and the audience watches as their adventure unfolds. I love it when I walk into a theater expecting an average movie, and end up walking out with something twenty-times better than what I expected. ‘Seeking a Friend for the End of the World’ is a film that I wanted to see again right when the credits rolled (and also couldn’t wait to write about), because the film itself did something similar to a magic trick. It opens in dark, nihilistic fashion, leaving the audience to believe that it’s all down hill from the start. But on the contrary, from the first five minutes until the last shot, ‘Seeking a Friend…’ gradually uplifts the audience to an emotional conclusion, while also wrestling with themes of contentment and true happiness. This next part may seem like a stretch, but just stick with me on this one. In my mind, the movie itself is really a microcosm of how humanity deals with mortality and death, and the remaining life that Dodge and Penny have is simply an allegory of life as we know it. The story is pointing out that in reality, our time on this planet is short, and it is what we choose to do with that short amount of time that really defines us. By making a movie about what happens when we realize that our world is collapsing, writer/director Lorene Scafaria was able to show us what is most important. Love, friendship, and at the end of the day, having someone by your side. Like in life, at the beginning our characters have goals that they want to achieve. They spend their time fighting and searching for the right path to get them where they want to be. But, there comes a point where Dodge and Penny realize that what they were searching for was right in front of them all along (cue romantic music). I don’t want to ruin the ride for anyone, so I will simply close with a quick observation about how ‘Seeking a Friend for the End of the World’ was received by the critical masses. Film critics will choose any number of reasons to give a movie a bad review. It could be that it didn’t end the way they felt would be appropriate, or it could be the way it was shot or written. It can honestly be something as simple as the characters not being ‘likable’. And this is why you can’t hold out too much on what the critics think: in the end, it’s really just a collaboration of slightly-snarky and cynical opinions. I honestly believe that this movie received mixed reviews because it made critics feel something they didn’t want to feel, and made more importantly, showed man as something that they didn’t believe to be true. It painted man as having the potential for goodness in a world that was all going down the tubes. It showed two people that could fall in love in just a few short days. It boldly stated that love conquers even death, and that is something incredibly counter cultural. And what can I say; I’m a lover, not a hater. So, when it comes to feel-good movies, it’s my practice to not listen to the critics. They’re all sad and lonely anyway. Just kidding, Roger Ebert. I’m still interested in writing that book with you. Your move, Ebert. My Note: The most surprising movie of the summer. You’ll laugh, you’ll cry, and you’ll enjoy. Remember when you were young and in love? I know it’s tough, but think really hard. I’m talking about when you were just a kid and you fell in love for the very first time. It was three parts romance, two parts awkward, all mixed together to make a magical cocktail that made you feel like you were flying. As simple as life is for a child, first love was the thing that made it seem whimsical, like the stories that you read in a book. Did anyone else get married for the first time when they were about 8 years old? We had the ceremony in the backyard of her house. My sister acted as the ordained minister and the aisle we walked down was a Slip-‘N’-Slide. After we said ‘I do’ we ran and slid down the hill into a pool of muddy water. We figured out the service would be much more exciting if we included the things we both loved about water parks. Suzy and Sam spend the entire year writing to one another, and over time they realize that the only thing that they have in the entire world is each other. When Sam returns to Suzy’s hometown for another summer of scout camp, he decides to be daring, and flees his campsite to run away with the girl of his dreams. The film centers around the relationship between Sam and Suzy and their desire to be with one another, but it would be incomplete without the adults that surround these two characters. There is Scout Master Ward (played by Edward Norton), who is doing is best to find his lost scout while also maintaining control over his remaining troop, Captain Sharp (played by Bruce Willis), who begins to admire the spirit of the escapees, and Mr. and Mrs. Bishop (played by Bill Murray and Frances McDormand) who do nothing but worry about their “troubled” daughter. None of the “grown-ups” can understand why these two young people are acting so insane. That’s because they’ve forgotten what it’s like to be a 12 year old and to be head-over-heels crazy about that someone. Really, that is what Writer and Director Wes Anderson is trying to do through ‘Moonrise Kingdom’: remind us what it was like when we were young and foolishly devoted to one another, and that is really what makes it such a brilliant film. We are again placed into a world where the childhood fantasy seems alive within us. In a world where we would normally be standing beside the authoritarian guardians, we find ourselves rooting for these two crazy kids to end up with one another. Why is that? Could it be that there is still something inside us that admires a child’s innocence and passion? I think Mr. Anderson is on to something here. In reality, it’s one of the reasons we still go to the movies. We look to be amazed, to reminisce, to feel something we haven’t in a long time. We want to be a kid again, and ‘Moonrise Kingdom’ let’s us do that. 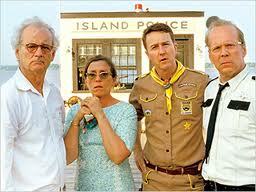 There are some people that have to be given credit for making ‘Moonrise Kingdom’ such a great film. The first of these is Wes Anderson. In my mind, this director who has been known for a strong cult following from Indie-film fans, has truly made a masterpiece, and his best film to date. Anderson’s vision for every aspect of a film, the writer, the art direction, the cinematography, and the performances, unite harmoniously in a creative movie with one common purpose. We see aspects of his previous films (such as “The Royal Tenenbaums”, “Rushmore”, and even “The Fantastic Mr. Fox”) throughout the film, but he has taken all of their strengths and none of their weaknesses, putting all the nuggets of Indie magic into a delightful hour-and-a-half. What I’m trying to say is, I hope Anderson gets some serious recognition this time around. I’m looking at you, Academy. The next group of people that deserves to take a bow are all of the seasoned veteran actors that play the supporting characters within ‘Moonrise Kingdom.’ Norton, Willis, Murray, McDormand, Swinton, Schwartzman, and Keitel are all pitch perfect in this movie, walking the tight-rope between absurdity and authentic emotion. 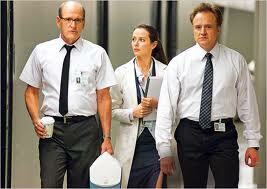 I have no problem in saying that this is the best ensemble performance of 2012 so far. I mean what’s going to compete with it? Magic Mike? Please. Finally, and this cannot go without saying (and many have written reviews on this film without saying it) but the young actors in this movie are fantastic. Suzy, Sam, and the members of the Khaki Scouts of North America take this movie from good to great, and they are the catalyst that makes the film both authentic and special. I don’t know where they found Jared Gilman and Kara Hayward, but I’m sure glad that they did, because these two actors are truly gifted (especially Hayward. Gosh, she was good.) But the scouts of Troop 55 are so funny and so sweet that you can’t help but love them. My Note: This is the best movie from the first half of the year. Go and see it before they pull it out of your local theater, because it is truly a hidden gem. Well, if you had told me 3 months ago that ‘Men in Black III’ would end up being a better movie than ‘Prometheus’, I would laugh and just assume that you have no clue what you’re talking about. But, here we are. Thinking in retrospect, I really do love the first’ Men in Black’ movie. Wildly entertaining, original in every way, full of satire and dark comedy, and it took the “Buddy Cop” relationship to the realms of Sci-Fi with Will Smith and Tommy Lee Jones at the helm. 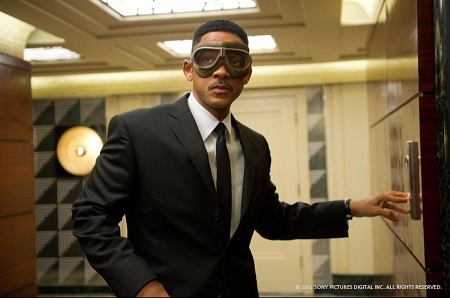 ‘Men in Black’, along with ‘Independence Day’, really made Will Smith a star and eventually allowed him to become one of the most successful actors of the 2000’s. It killed at the Box-Office, making over $250 million (and in a pre-‘Titanic’ world, this number was ridiculous), it also garnered respect from both the critical audience and the public at large. It had all of this, not to mention the “Noisy Cricket”, an “Edgar-suit”, and Frank the talking dog. Then ‘Men in Black II’ happened… Goodness. I feel that there’s no need to go into further detail, because it would just be several sentences of mean, and no one would want to read that. ‘Men in Black II’ was so bad, that I, like many others, just assumed that the franchise was as a dead as disco. Not only was the sequel bad, but franchise director Barry Sonnenfeld went on a long streak of making really awful movies, including (but not limited to) ‘Wild Wild West’, ‘Big Trouble’, and ‘RV’. Yikes. However, the powers that be decided to make a third installment, bringing back both Will Smith and Tommy Lee Jones (which I assume were paid incredible amounts of money in order to be convinced that it would truly be better than the second) to reprise their roles as Agent J and Agent K. They even signed on Sonnenfeld for another crack at it. Talk about believing in a guy that no one else would. Surprisingly- scratch that- Shockingly, ‘Men in Black III’ was not only better than the awful sequel the preceded it, but it is also one of the best movies that I’ve seen this year. As funny and entertaining as the first, with a new twist on the story, ‘Men in Black III’ takes all the good from first film, heats it up in the microwave, and served it all over again. Some people don’t like leftovers, but it tastes delicious when you’re expecting garbage. ‘Men in Black III’ opens with the lunar prison break of Boris the Animal (played by Jermaine Clement), a savage alien killer that was put away by Agent K back in the 60’s. He travels back to earth to exact his revenge K, and decides to do this in a more roundabout way: by going back in time to kill his nemesis. At the MIB headquarters, we find a frustrated J and an ever so disgruntled K. We learn that since the second film, Agent Zed has died and has been replaced by Agent O (played by Emma Thompson). But then, just as our fellow agents find out about the escape of Boris the Animal, K mysteriously disappears, not only from his home and his work, but he also disappears from the memories of the people that once knew him well. Agent J realizes what has happened; Boris the Animal went back in time to kill Agent K. What is Will Smith to do but go back in time himself to stop the psychopathic extraterrestrial? Pretty cool, right? Believe it or not, the best thing about this movie are not the performances by Tommy Lee Jones or Will Smith, but the performance of Josh Brolin playing the young Agent K. Some would say that Brolin is simply doing an impersonation of Jones himself, but what he really does is show a different side to a once very flat character, giving the audience a deeper look into who Agent K really is. Not only does this element of time travel allow J and K to connect like never before, but also allows us to connect with them more as well. Brolin does this with a masterful precision and control, making sure that the viewer never loses sight of the character at hand. Side-note: Josh Brolin is not quite at “man-crush” in my books, but he’s definitely getting there. Still growing as an actor, I see this guy really taking off in these next few years. When you really get down to it, the reason ‘Men in Black III’ was able to return this franchise to providence was it decided to focus its energy on what made the original one so good in the first place: original story telling, and a real relationship between our two lead characters. The second movie was no good because it had no story that grabbed us, no real goal that the audience was trying to reach with the characters. Heck, half of the movie was just everyone trying to figure out what’s going on, and in the end, we still didn’t get a clear answer. The latest film remedies this problem by giving us a story we can get into and characters that we can stick with from beginning to end. Does anyone even remember an authentic moment between J and K from ‘Men in Black II’? Did they even speak to one another!? Woah… ease up. Remember, we’re talking about ‘Men in Black III’, not it’s ugly step brother. Brolin and Smith really do have a great contrasting chemistry that works, and it brings us back to the original formula that made this franchise work. Although it isn’t fresh this time around, it remains refreshing, and makes ‘Men in Black III’ a movie that is worth watching. My Note: ‘Men in Black III’ is really just the microwaved leftovers from the original movie, but at least it’s edible. Me, like many other movie goers, head into the summer with a heart full optimism and excitement. Summer, although it is not typically where movies find Oscar Gold, it’s where movie magic happens. It is when the studios release their money-making machines and watch with anticipation as the box-office numbers come rolling in. It’s the movies that we line up for; we watch the trailers on repeat, waiting for when we can go see them at midnight; we mark our calenders, counting down until we actually go to the movies. ‘Prometheus’, for me, was one of those movies I couldn’t wait for. It was right behind ‘The Dark Knight Rises’ for my most anticipated movies of the summer. It appeared to have everything I love; solid cast, a proven director, and enough Sci-Fi action on an epic scale to make any ‘Firefly’ fan take notice. The night I went to see it, me and my buddy Michael went and grabbed some dinner, and we were pumped. We kept saying, “So excited to see this movie, it’s gonna be great.” Are you getting the picture here? I was hopeful. Excited. Looking forward to a killer experience. Wow. What a heaping pile of lame-sauce let-down. The general premise of the movie is this: A crew ventures out into space to search for alien life that some believe will answer questions regarding the origins of mankind. The crew hibernates during travel, and when they arrive to their destination, they enter the atmosphere of the secluded moon to begin their expedition. Almost immediately, without much effort at all, they find the home base of what’s left of an alien race, and what’s left are corpses and seemingly abandoned ruins. Before I go on to the real reason why ‘Prometheus’ has issues, let me first say what the film does well. Visually, ‘Prometheus’ stunning. Ridley Scott’s ability to create an other-worldly setting is a gift that he has not lost, taking the audience to a world that is both grandiose and eerie. The look of ‘Prometheus’ is really what initially makes it engrossing; we are placed right in the middle of this amazing spectacle of science fiction magic. Alas, if only the writing was as beautiful as the scenery, but we’ll get to that in a moment. Again, Michael Fassbender gives a good performance as David, the polite android that ends up having an agenda of his own. The only thing that keeps him from being exceptional is the script, but the guy can’t help that so he still remains on a win streak in my book. Although the film wasn’t great, it was a nice career move to do it. It keeps him relevant and allows him to explore new territory. After all, who would turn down playing the robot in the new Ridley Scott Sci-Fi epic? Look what it did for Daryl Hannah’s career… Yikes. Now, let the ripping begin. The most glaring problem with ‘Prometheus’ is the story, which is completing void of life or brilliance. When the movie begins, we are introduced with a handful of questions, and from this point on, it goes nowhere. Sure, a lot of events take place, but the audience is no more fulfilled at the end of the movie than they are at the beginning. This goes against the grain of true story-telling, that the characters go through conflict to arrive at a certain place, goal, or realization at the end. We walk out of the theater still pondering the obvious holes in the plot that were never truly answered, hoping there is something after the credits that could explain what the script had left out. At the end of it all, I felt as lost and abandoned as the crew floating through space. And imagine my surprise when I found out that ‘Prometheus’ was co-written by Damon Lindelof, one of the creators of ‘Lost’. Did this guy get a PhD. in making us feel confused and unsatisfied? The other point that pushed me away from liking this movie was the manner in which it was trying to entertaining the audience. Instead of striving for authentic thrills and action, the director decided to make the tragic mistake of making the most exciting moments in the film be nothing more than gross-out shots of alien brains, space slugs, and loss of limb. ‘Prometheus’ isn’t trying to entertain it’s audience as much is it is trying to nauseate them, and it made me sick to me stomach in more ways than one. More than anything, I found myself annoyed that the writers reduced themselves to using old horror film gimmicks to garner a response. Specifically, there is a sequence in which our heroine, played by Noomi Rapace, becomes *SPOILER* inpregnated with an alien fetus and must use a surgical machine to pluck it out of her body. I felt like we saw this in ‘Alien’ over 30 years ago. Perhaps the writers forgot, but I know I didn’t. Noomi Rapace is so flat in this movie, I feel like someone should check for a pulse. So far, I have not been impressed by the Swedish phenom. Granted, I’ve only seen her in this and ‘Sherlock Holmes’, but she was so forgettable in both movies. And to think of the outrage that some had in response to Rooney Mara’s portrayal of Lisbeth Salander (The Girl with the Dragon Tattoo), that it paled in comparison to Rapace’s rendition. Give me Rooney any day of the week, twice on Sunday, because Noomi is simply a fad that will eventually fade away. And my final beef with ‘Prometheus’ is this; to begin a film with asking questions about the origins of man, then it ends by saying our creators are nothing but vicious alien giants, is weak. It’s like meeting a girl at the party that doesn’t have anything nice to say about their parents; it just makes you really unattractive. Okay, now that I got that out of my system, let me take a step back and close with this thought. Ridley Scott has, yet again, come up short with ‘Prometheus.’ Has anyone looked at this guy’s filmography in the past 10 years? He has really been struggling to make a great movie since ‘Gladiator’ with only a few bright spots here and there. 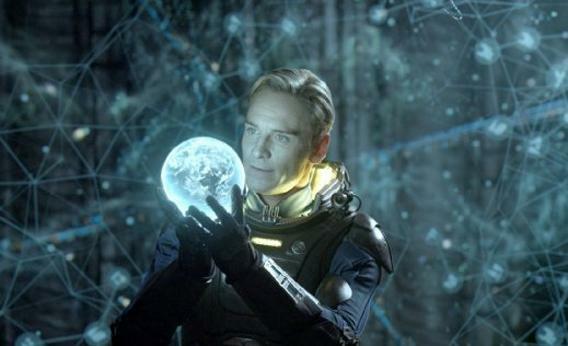 Really, I think I expected too much out of ‘Prometheus,’ and in a way I think we all did. It was never going to be ‘Alien’ and it was never going to be ‘Blade Runner.’ It tough to strike gold twice in the same place. Three times? It’s nearly impossible. 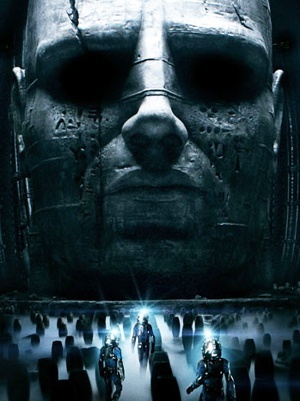 My Note: So far, Prometheus is the biggest let-down of the year. On the bright side, it’s only June.